Had to share this darling picture that some friends took when visiting the USS Midway museum in Southern California. 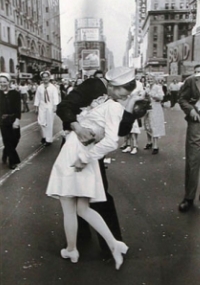 You all remember the famous picture “The Kiss” taken in Times Square at the end of World War II. Well apparently they’ve made a huge statue of it (located at the USS Midway museum).